USA Swimming is the National Governing Body for the sport of swimming in the United States. With over 300,000 members, the organization promotes participation and advancement in the sport through clubs, events and education. Dean Ekeren serves as National Events and Marketing Director for USA Swimming. In this role he oversees the planning and promoting of events on a national and international stage, as well as leading national marketing initiatives. USA Swimming hosts swimming events around the country to promote their sport and foster healthy competition, spurring growth and increasing the skill level of US swimmers. While the organization is headquartered at the US Olympics Training Center in Colorado Springs, Colorado, many of their events are hosted at facilities in other states. Dean Ekeren organizes and markets some of the top national and international events in the sport of swimming, including Conoco Phillips National Championships, Mutual of Omaha Duel in the Pool, Pan Pacific Games, and the US Olympic Swimming Trials. The events are televised around the world and generate corporate sponsorship opportunities that support the sport’s growth. Aquatic facilities present unique challenges to event organizers. Traditional pool decks often utilize tile or concrete flooring and walls to accommodate the wet conditions. When wet, these surfaces can become slippery, creating a safety concern. USA Swimming sought a product that would improve competitors’ safety around the pool. USA Swimming events are hosted at multiple facilities around the United States, creating a need for a product that could be easily applied, removed, stored and reused at consecutive events. Ekeren saw an opportunity to select a product that could be used customized and used at multiple facilities to strengthen USA Swimming’s brand image and improve aesthetic value for television purposes. PEM Surface Creations provides slip resistant matting for the aquatic, golf, equestrian and playground industries. PEM Aquatic Matting has several features that make it an ideal solution for the aquatic industry. The lightweight construction makes for easy handling while the porous design allows moisture to flow through, eliminating standing water. The antimicrobial formula guards against the growth of bacteria, mildew and fungi, even in the dampest of conditions, and the textured surface reduces slippage under wet conditions. PEM assisted Ekeren and USA Swimming with the ordering of PEM Aquatic Matting for their events. The organization selected high-visibility blue matting that coincided with their brand colors. The matting was used as a slip-resistant surface cover for existing pool decks. PEM ensured USA Swimming had all the supplies they needed, and had materials delivered exactly as requested. PEM® slip-resistant matting trims easily with a razor knife, allowing USA Swimming to trim the matting to appropriate lengths and customize the product with their name. PEM® Aquatic Matting made its USA Swimming debut at the 2004 US Olympic Swimming Team Trials in Long Beach, CA. The matting provided a high-contrast, vibrant background for television audiences, satisfying Ekeren’s need for an aesthetically pleasing surface to cover the existing pool deck. The bold blue matting has become a visual trade-mark at many USA Swimming televised events. PEM Aquatic Matting provided USA Swimming the ideal solution for their competition facilities. The high quality construction and lightweight design has proven the product to be an economical investment for the organization. 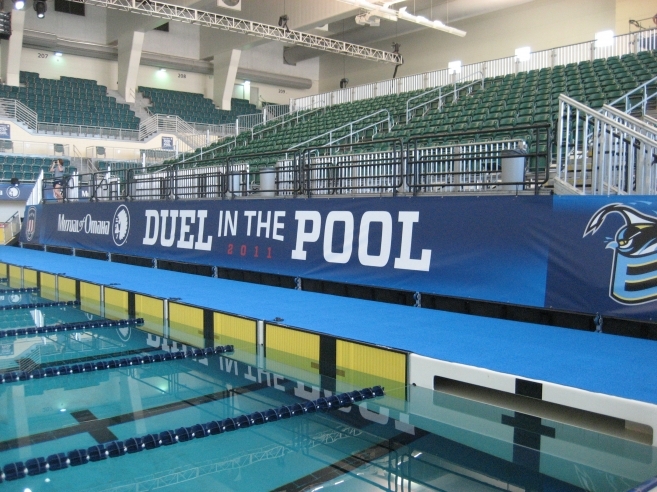 The matting was quickly and easily installed and has served them through several events, including the ConocoPhillips National Championships, Mutual of Omaha Duel in the Pool, past US Olympic Trials and the Mutual of Omaha Pan Pacific Championships. PEM® Aquatic Matting will also be used at the 2012 Olympic Trials in preparation for the 2012 Olympic Summer games. Ekeren has been pleased with the safety and aesthetic values the matting offers to events. Where once the pool decks were a slip hazard, they are now a bold shade of blue, protecting competitors from falls while improving and unifying facility appearances. USA Swimming is also pleased with the ease of cleaning the matting during and after events. Having investigated several surface application solutions before selecting PEM Aquatic Matting, USA Swimming is confident they made the right decision. The easy ordering process, simple installation, and lasting construction have all proven to be great benefits to the organization.